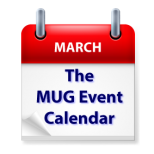 This week’s MUG Event Calendar features virtual visit by Jim Dalrymple of The Loop to a New York group and Chuck Joiner of The MUG Center to an Illinois group. Social media will be discussed at a Pennsylvania group, and syncing data across Apple devices will be the topic at a Virginia group. Other topics for the week include HomePod, Apple Pay, Apple Music, YouTube, genealogy, High Sierra, and much more.